KUALA LUMPUR (Dec 1): Based on the news flow and corporate announcements today, the stocks that may be in focus on Tuesday (Dec 2) could include CIMB Group Holdings Bhd, RHB Capital Bhd, Malaysia Building Society Bhd (MBSB), Gamuda Bhd, CAB Cakaran Corp Bhd, Mudajaya Group Bhd, Versatile Creative Bhd, Berjaya Auto Bhd, Malaysia Pacific Corp Bhd and Boilermech Holdings Bhd. CIMB Group Holdings Bhd, RHB Capital Bhd and Malaysia Building Society Bhd could see trading action as CIMB chairman Datuk Seri Nazir Razak was reported as saying that he was confident that the three-way mega merger will go through with or without the Employees Provident Fund’s (EPF) vote. “We are very confident that once we put the business case to the shareholders meeting, we will get the endorsement of shareholders. We think we will get it through with or without EPF,” Nazir told pressmen today at the launch of the second set of Lifting-The-Barriers (LTB) reports by the Asean Business Club Delegation and CIMB Asean Research Institute. He was asked if the decision by Bursa Malaysia to bar EPF from voting on the merger would jeopardise the deal, and if there had been objections from major stakeholders like Abu Dhabi-based Aabar Investments. Nazir also expressed optimism that when the merger happens, it “will stand on its own merits, so whoever can vote will be able to consider it”. Gamuda Bhd has proposed to acquire a 99-year leasehold land measuring 104.1ha in Kuala Langat, Selangor, for RM392.17 million cash from Bukit Melati Sdn Bhd. The land is currently classified as agricultural land, with a lease tenure of 99 years expiring on Sept 16, 2111. Gamuda said the acquisition will increase its land bank, as well as investment property portfolio, to provide long term earnings growth. Gamuda counter closed 5.48% or 29 sen lower at RM5 today, giving it a market capitalisation of RM12 billion. Food producer CAB Cakaran Corp Bhd has proposed a bonus issue of up to 65.889 million warrants, which have five-year tenure, on the basis of one warrant for every two existing shares held by its entitled shareholders. In a filing with Bursa Malaysia today, CAB Cakaran said the proposed corporate exercise is to reward its existing shareholders for their loyalty and support. It also provides opportunity for its shareholders to further participate in the future prospects and growth of the company. Assuming full exercise of warrants, the gross proceeds to be raised by the company is about RM32.94 million, which will be utilised for the working capital of CAB Cakaran. The corporate exercise is expected to be completed by the first quarter of 2015. 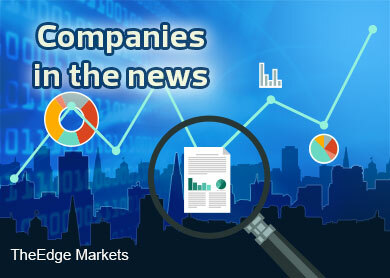 The Edge Research today highlighted CAB Cakaran as one of the “Stocks with Momentum”, which was published in The Edge Financial Daily. Year-to-date, CAB Cakaran's share price has risen 66 sen or 125% to settled at an all-time high of RM1.19 last Friday (Nov 28). The counter is suspended today and it will resume trading tomorrow (Dec 2). Mudajaya Group Bhd’s wholly-owned unit Mudajaya Corp Bhd (MCB) has bagged a RM55.5 million civil works project for the Pengerang cogeneration (cogen) power plant in Johor. In a filing with the bourse today, Mudajaya said it has signed a contract with Siemen Malaysia Sdn Bhd to construct and complete the main civil works for the power plant. The main civil works without optional works undertaken by MCB is expected to complete by Feb 5, 2016. The optional works are valued at RM157.9 million, while the project is expected to contribute positively to the group for the financial year ending Dec 31, 2015 onwards. Mudajaya shares were down 5 sen or 2.73% to close at RM1.78 today, giving it a market capitalisation of RM963.74 million. Paper and boxboard packaging products manufacturer Versatile Creative Bhd is at risk of being suspended from trading if it fail to rectify its public shareholding spread, which stood at 9.82% as at Nov 27, 2014. In a statement to the exchange today, the group noted that the suspension will be effective on Jan 13, 2015, being the market day immediately following the expiry of 30 days from Nov 28 this year. Versatile Creative said it plans to address the non-compliance on its public shareholding spread by way of disposal of shares by major shareholders. Shares of Versatile Creative closed 6.5 sen higher at 94.5 sen today, with some 121,600 units changing hands, giving it a market capitalisation of RM104.56 million. Berjaya Auto Bhd (BAuto) has signed two separate share sale agreements to buy 20% stake in Inokom Corp Sdn Bhd for RM30 million, in a move to expand its business operations upstream. BAuto said it acquired 10% stake of Inokom from Berjaya Group Bhd, and another 10% stake from Pesumals (M) Sdn Bhd. Each of the transactions cost BAuto RM15 million. Inokom is the contract assembler for certain Mazda models, namely Mazda 3 and CX-5 in Malaysia. Property firm Malaysia Pacific Corp Bhd (MPCorp) has fallen into Practice Note 17 (PN17) status today after its external auditors expressed a disclaimer opinion on its latest audited accounts for the financial year ended June 30, 2014 (FY14). In a filing with the stock exchange today, MPCorp said its external auditor Messrs BDO has not been able to obtain sufficient appropriate audit evidence to provide a basis for an audit opinion. Messrs BDO highlighted that the current liabilities of MPCorp at the group and company level have exceeded their current assets by RM262.971 million and RM89.571 million respectively. In a separate filing, MPCorp said its net loss narrowed to RM3.3 million for the first financial quarter ended Sept 30, 2014 (1QFY15) from RM5.25 million a year ago. Revenue for 1QFY15 rose 5% to RM3.08 million from RM2.94 million due to higher contribution from rental of investment property during the three months. Meanwhile, ACE Market-listed Boilermech Holdings Bhd has been granted the approval by Bursa Malaysia to transfer to the Main Market, with the date of the transfer fixed on Dec 4, the company announced today. The biomass boiler manufacturer is 40.71%-owned by QL Resources Bhd.